This is the true story of a rock and roll musician who takes up taekwondo at forty years old. Doni Blair, bassist for the Toadies, knows he’s past his physical prime, but he’s determined to push himself and pursue his dream of becoming a martial artist—even if it kills him. As a kid Doni was obsessed with ninjas and kung fu movies. He and his brother took up taekwondo—there was no ninja school in Sherman, Texas. Classes were expensive, especially considering their parents’ tenuous employment status and fondness for alcohol. The family lived like “white-trash gypsies,” Blair writes, adding that he got good at moving furniture at three in the morning. The Blair kids loved taekwondo, but the family just couldn’t afford classes. Doni walked away from martial arts. Thirty years later, he’s walking back. Doni discovers the road to black belt is rough and, well, weird. He meets martial seekers of every sort. He has run-ins with a teenage savant who seems determined to break the author’s leg. He drives a van full of seven-year-olds for the dojang’s after-school program. They puke everywhere. Even If It Kills Me is smart and funny, introspective and irreverent. It blends rock and roll and taekwondo—two of the coolest things in the world. 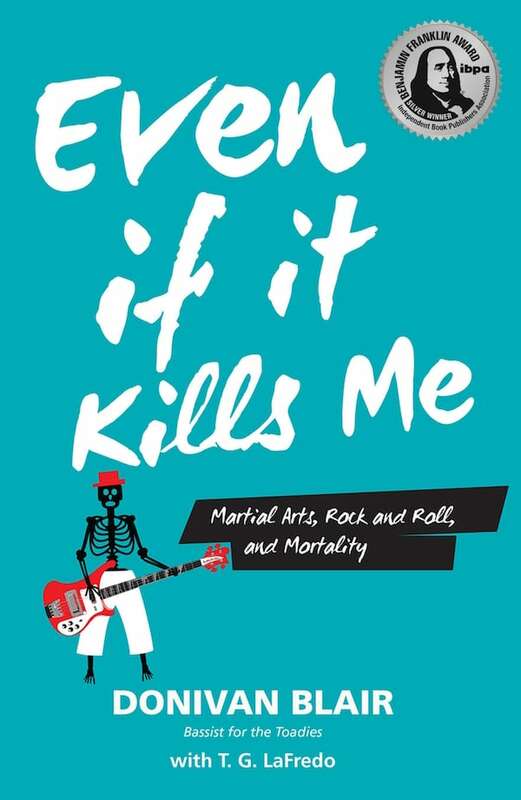 "Sweet and funny, introspective and irreverent, impressively well written, organized and presented, Even If It Kills Me, blends rock and roll with taekwondo in an exceptional and unreaservedly recommended memoir that is certain to be an enduringly popular addition to community library collections. It should be noted for personal reading lists it is also available in a digital book format." —Michael Dunford, Reviewer for Midwest Book Reviews at Dunford's Bookshelf.